I have been involved in visual art for most of my life: art classes, dance classes, dance performances and choreography, BA in dance and teaching dance classes. Then exploring other ways of artistic expression while I was working in the corporate world. 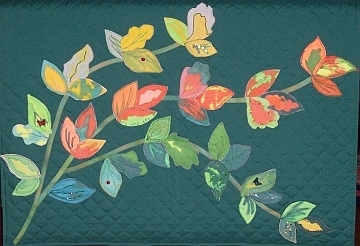 The art mediums I work in today include acrylic, mixed media, and fiber. The following gives an example of my seeking visual expression of faith. As with many people, the pain and suffering that exists in God’s glorious creation tears at my heart. I struggle mentally, emotionally, and spiritually. I fight despair, especially when it comes to children. It was the summer of 1996. Along with caring deeply about the death of a dear man and gifted artist, the murder of a mother at our school, and the suicide of a young woman – TWA flight 800 crashed. All those lives lost of people I did not know, and three I did know – a courageous and beautiful woman with her two lovely young daughters. That summer there were many children and adolescents suffering from debilitating and life-threatening diseases such as leukemia. So much fear and pain for kids I did not know, and one I did know – my nephew Chris. I searched through Scripture and I sought in prayer some way to deal with pain and suffering. It was Colossians 1:17 that led me out of despair. It was Colossians 1:17 that I prayed and prayed that summer as I manipulated torn and shredded pieces of color alone in my workshop. And I came not to understanding or even acceptance; it was and is a place of belief. 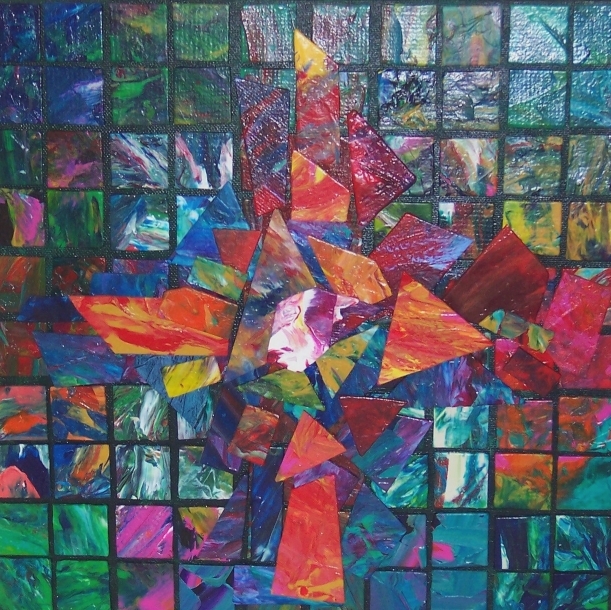 In my life and in my art, fragments come together in shape and image because Christ is before all things, and in him all things hold together. To strive to give honor and glory to God through visual expression is a joy. 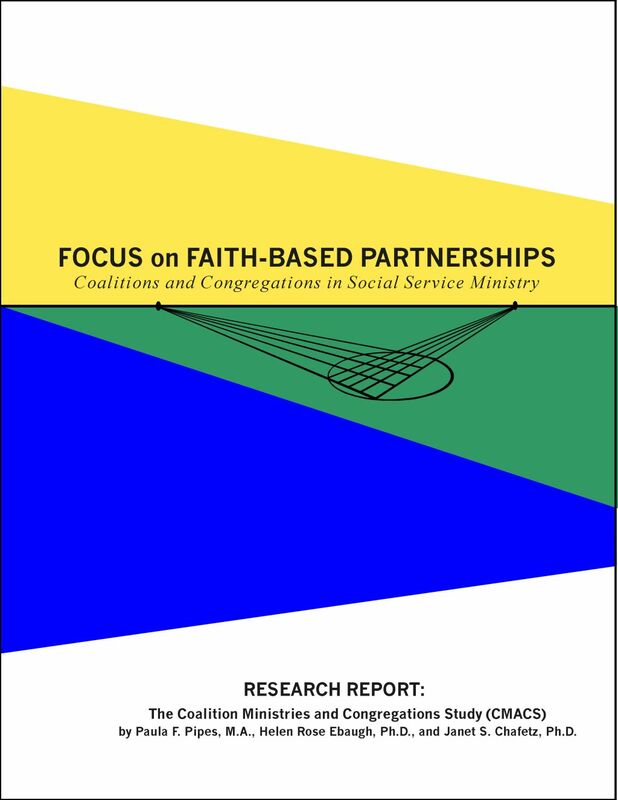 It is a privilege to seek ways to enhance worship, contribute to the environment of praise, prayer and celebration of sacrament. 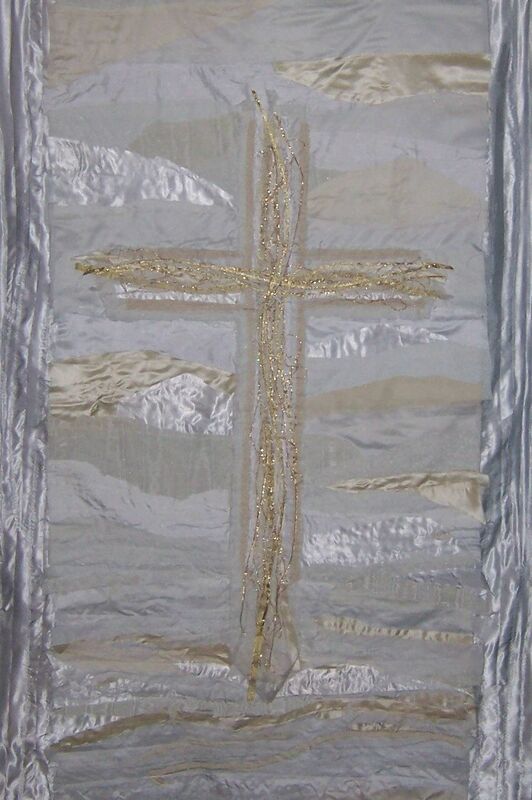 It is especially meaningful and important for me to design ways that members of the church community can be involved in the creation of liturgical art for worship, for liturgy is the work of the people. 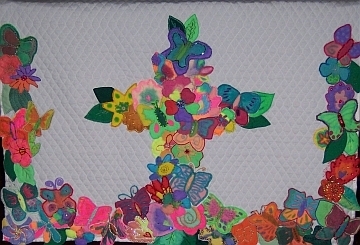 Children from Holy Spirit Episcopal Church and Holy Spirit Episcopal School in Houston, Texas were involved in making liturgical hangings for the Children’s Chapel. 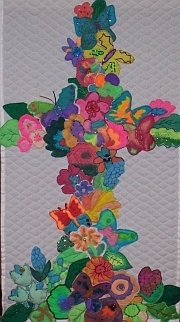 Sharon Baker from the church community spearheaded this project Children created artwork using fabric markers on cloth. 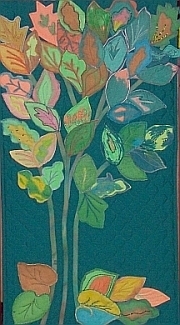 Adults from the church and school, including myself, made appliqués of these pieces of art using embroidery, embellishment, and quilting. I created the design and did the assembly and sewing. 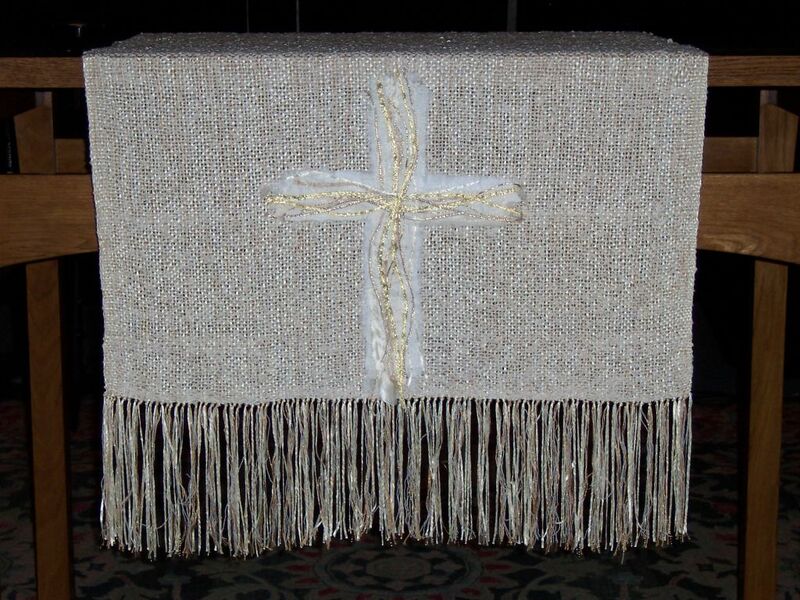 the yarns and fibers in creating the cross that attached to her altar piece and incorporated them into the banner that hangs on the wall behind the altar. NAMI West Houston is one of the local affiliates. with Mental, Emotional and Behavioral Disorders.